Is the Siamese the Right Cat Breed for You? Is the Siamese right for you? Graceful, lithe, exotic, and captivating – the Siamese’s distinct look has been a favorite for a long time, and served as the basis of many new breeds. Sapphire eyes, satellite dish ears, and a distinctly pointed face give this cat a look like no other. This intensely affectionate breed defies any aloof cat stereotypes, and in addition to the close bond they form with their owners, they are generally extroverted around strangers. The love of a Siamese is not a love you will soon forget – particularly because this highly vocal cat will not hesitate to remind you. The Siamese is perhaps best known for their pointed coat. This occurs because of a gene for partial albinism, and is caused by a heat-sensitive enzyme that fails to work at normal body temperature. The result is a darker coloration where the cat’s body heat is lowest: the legs, tail, ears, and face. Siamese living in cooler climates will tend to have darker coats than those living where it’s warm. Long haired Siamese are classified under the name Balinese. In addition, cats with the Siamese body type lacking the classically colored points may be registered as Colorpoint Shorthairs or Oriental Shorthairs. Because of their unique look and loving personalities, the Siamese has also served as a foundation breed for many newly developed cat breeds, including the Birman, Burmese, Havana Brown, Himalayan, Javanese, Ocicat, Snowshoe, Thai Cat, and Tonkinese. The Siamese is recognized in two distinct body types: traditional and modern. The modern Siamese is recognized as having a sleek and slender body, long throughout. This cat has a very fine bone structure with narrow hips and torso, a long body, long neck, long tail, and long legs with small, dainty feet. Though quite slim, the modern Siamese is a well-muscled cat. The head and face is the most distinguishing characteristic of the modern Siamese, distinctly wedge-shaped, forming a triangle from nose to ears. The muzzle is quite long, forming an even plane from forehead to nose. The ears are large and wide-set, with a wide base. The eyes are almond-shaped with a distinct slant, medium in size. Blue eyes are preferred, but green, gold, or odd-eyed colors are also possible. The traditional Siamese is distinctly less long and lean, with a medium build. The traditional Siamese is sometimes referred to as an Appleheaded Siamese, as the head has a much subtler wedge-shape with fuller cheeks and chin. The muzzle is more of an average length, and the nose is slightly convex from forward to nose tip. The ears are more proportional with the face, shorter and rounder than that of the contemporary Siamese. The eyes tend to be more rounded. The Siamese’s coat is very short and close-lying, fine textured. Both traditional and modern Siamese are notable for their pointed coats. The body of the Siamese is usually a white or cream, and recognized point colors vary by breed organization. The Cat Fanciers’ Association only considers pointed coats of seal, blue, chocolate, or lilac to be acceptable. Siamese cats with different point colors and patterns are recognized as Colorpoint Shorthairs. Other breed registries accept any pointed coat as Siamese, including red and cream point, lynx point, and tortoiseshell point. Cats with a Siamese-type build but a solid, non-pointed coat are generally registered as Oriental Shorthairs. 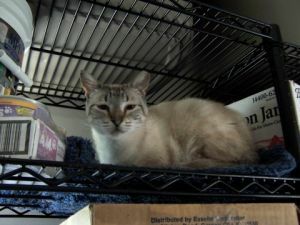 Unfortunately, the Siamese cat may be prone to more health issues than other cats, and because of this it’s especially important to choose a breeder with responsible breeding practices. The average lifespan is between 10 and 12.5 years, though the world’s oldest male cat was a Siamese named Scooter, who died at age 30. They may have a higher risk of tumors, including mammary tumors. Amyloidosis, a disease that primarily affects the liver, is more common in Siamese cats. They may have a slightly higher risk of heart disease. A hereditary condition known as Progressive Retinal Atrophy is also possible in the breed. Finally, the same albino gene which causes the Siamese’s unique coat can result in the cat being cross-eyed. While this is not specifically a health concern, it can reduce a cat’s night vision and hunting acuity. The Siamese is a loving, loyal, and interactive cat. This is a cat for someone who wants a constant companion, and doesn’t mind if kitty’s a little clingy. They adore the people in their lives, and they thrive on attention and companionship. If you’re away often, the Siamese might not be for you. Many Siamese owners have said their cats are happiest with another feline companion that can keep them company during the day. They do well with kids and other pets. 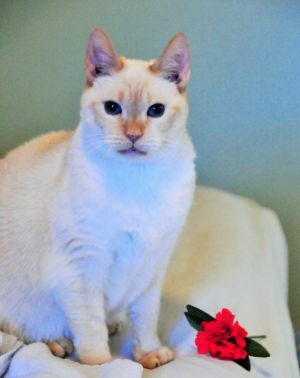 Intelligent, playful, and curious, the Siamese has a fairly high activity level. They will enjoy having lots of toys to play with, and some are even quite fond of playing fetch. This is a very, very vocal breed – maybe the most vocal breed – so if you prefer the sound of silence, you will definitely become dissatisfied with the Siamese’s gift of gab. On the other hand, if you want a at who will make you feel a part of their day, you will never feel unloved with a Siamese. Siamese cats are great cats. They have been a lifetime favorite of mine (my childhood cat was a Siamese, we found him walking around a busy Randall's parking lot, he jumped in the car and refused to leave). 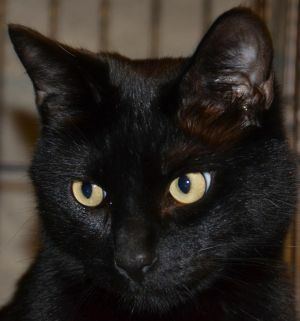 They are gorgeous cats for starters, dark tails/paws/ears and a lighter body. But they are incredibly noisy. This is not the cat for you if you want an aloof sterotypical cat: they are needy and demanding of attention. They can be very active: mine likes to play fetch (but in typical cat fashion it's usually at 3 in the morning). This is not the cat that will be content to sit at home all day while you are at work, they need entertainment. These guys do get a little more mellow as they age, but they are still quite affectionate, that ever ends! . When I was moving into a new house, I was taking both my dog and cat. I KNOW my cat hates car rides. When he is in his crate, especially in the car, he becomes quite aggressive and it was always pretty difficult to calm him down afterwards. During that move, we were going about 2 hours away and I was worried about how Nico may react to that kind of stress. Vet visits are hard enough for him. So I called the vet to see what she recommended. She thought that Neurontin would be beneficial to him. After giving him the prescription, the move was a breeze! He was very calm and it helped out a lot. I would use it again for sure!.